Celebrate this national holiday with a festive and healthy red, white, and blue smoothie. One thing I always notice at holiday gatherings is a smattering of unhealthy food. Don’t get me wrong, indulging once in a while keeps you sane, and the 90/10 diet, or eating healthy 90% of the time resonates with me. However, some holiday food spreads are just plain ridiculous. Why not bring something healthy to the table? This fruit smoothie is perfect as a tasty snack or dessert. You can even freeze it and serve as ice cream. 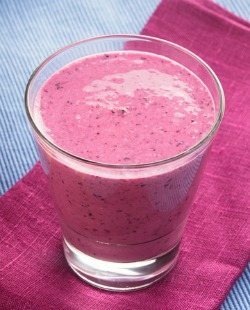 The berries in this smoothie provide plenty of antioxidant power, vitamins, and minerals. The Greek yogurt offers a decent amount of protein, and coconut provides healthy fat. All in all, this is one healthy smoothie you can feel good drinking or giving to your children. The recipe calls for 1 cup of strawberries. Feel free to substitute with raspberries or go 50/50 on the sweet red berries. Enjoy! Place all of the colorful ingredients into your high-speed blender and blend for around 30-45 seconds or until nice and smooth. Please leave a comment below if you try this delicious 4th of July smoothie. Happy Blending & Happy 4th of July! Hi,I would love to try the 4th of July smoothie but it is high in carbs and sugar.if I use a 1/2 a cup of the strawberries and blueberries would that bring down the sugar in this smoothie.I only have natrel milk and I have to go buy the rest of the ingredients then I will make this smoothie. Yes, using 1/2 cup of each berry will reduce the sugar quite a bit, Kim.